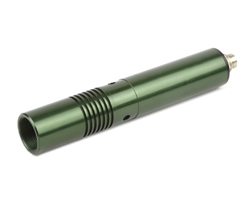 The FireFly green range sets a new standard for industrial grade, green laser diode modules. A radically new design provides TE stabilised performance without TE cost and power consumption. It is a self-contained laser that offers the user greater stability over a wider operating temperature and with much faster warm up time. The inbuilt Laser Intelligent Control (LIC) electronics provide stable CW or modulated operation with automatic power control (APC), reverse polarity protection and over temperature protection. The LIC ensures a high level of reliability over time and temperature. The laser operates from a low voltage input 5Vdc and a low operating current of 350mA (Max). The diode pumped solid state laser produces a large circular beam with low divergence and an output wavelength of 532nm with powers up to 50mW. For applications that demand reduced noise such as scanning and projection, a lower noise version is available that provides a RMS noise 1%. The lens system includes a steering lens that ensures accurate alignment of the beam with the case and a focusing lens that produces a high quality spot over a wide range if distances. The laser has a range of internal driver boards that provide either CW operation, analogue control or TTL pulse width modulation. Supplementary lenses are available that convert the spot to a line or across. The lines of the cross can be adjusted to be at exactly 90°, even when the laser is mounted at any angle to the surface.